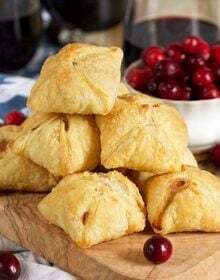 Quick and easy Cranberry Brie Pastries are fantastic for the holiday! Freezer friendly, too. Roll out the puff pastry on a lightly floured surface to approximately 12 inches x 12 inches. Cut the puff pastry into three long rectangles and then cut each rectangle into 3 squares. You will have 9 squares from each sheet of puff pastry. Place a teaspoon brie in the center of each square and top with a teaspoon cranberry sauce. Using a pastry brush, lightly brush the egg on the edges of the pastry. Then, pull the corners up to meet at the top pinching the seams together to seal the dough. Arrange the puff pastry bites on a baking sheet lined with parchment paper. Bake the puff pastry bites for 18-20 minutes or until puffed up and golden brown. Allow the puff pastry bites to cool for 4-5 minutes before serving. Puff pastry bites can be made in advance and frozen for up to 2 months. To bake from frozen, place the bites on a baking sheet and bake for 35-40 minutes.